Producer Sidney Sheldon signed Barbara Eden to star in his up-and-coming fantasy sitcom I Dream of Jeannie that would air on NBC. After various brunette starlets and beauty queens unsuccessfully tried out for the role, Eden was approached by Sheldon who had seen her in The Brass Bottle and had been recommended by various colleagues. Eden played Jeannie, a beautiful genie set free from her bottle by astronaut and United States Air Force captain (later major) Anthony "Tony" Nelson, played by Larry Hagman. Eden played this role for five years and 139 episodes. 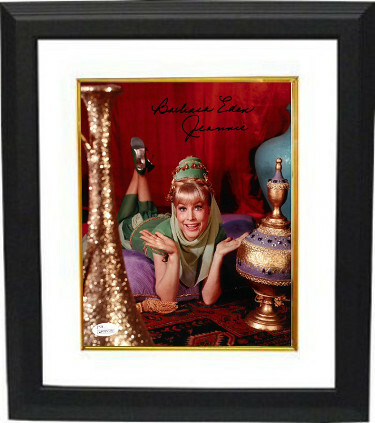 Barbara Eden has hand signed this I Dream of Jeannie 8x10 Photo with Jeannie inscription. JSA Witnessed (In the Presence) Hologram and Certificate of Authenticity. Custom White Mat and Premium Black Frame as shown.